A few years ago, the idea to implement a maglev line in Beijing was introduced. It wasn’t until the end of 2016 where the actual train was delivered to its sight. Line S1 floats 1 centimeter above the rail with the use of magnetic levitation. The line will cover a total of 10 kilometers with eight stops in between. It will be connecting the western district of Beijing in Shijingshan to Mentougou, where there is currently no operating metro. Also, it will be linking up with Beijing’s Metro Line 1 that will make traveling to the western region easier for those who live downtown. Originally, the idea of high-speed transportation as well as electromagnetic transportation patents were granted to many inventors across the world. Many variations of the idea were being used around the world such as the United States, Germany, and the United Kingdom. Through the different trials, there have been many defects and imperfections that caused the lines to shut down. Currently, only three countries, Japan, China and South Korea, have fully operating maglev’s that have been successful. Maglev’s are becoming more and more popular. Currently, there are many countries that proposed the idea of implementing a line to provide quicker transportation options. This method is known for using magnetic levitation in order to move the vehicles rather than traditional wheels. There is a rail that will act as a guide with the help of magnets to create a lift as well as propulsion. This levitation does not require much energy, in fact it helps overcome the drag allowing trains to travel at exceptional speeds. Electromagnetic Suspension: the train is able to levitate above the rail because of electromagnets that are attached to the train. Electrodynamic Suspension: both the guide way as well as the train itself exerts a magnetic field. The train is then levitated by the repulsive and attractive force between the two fields. 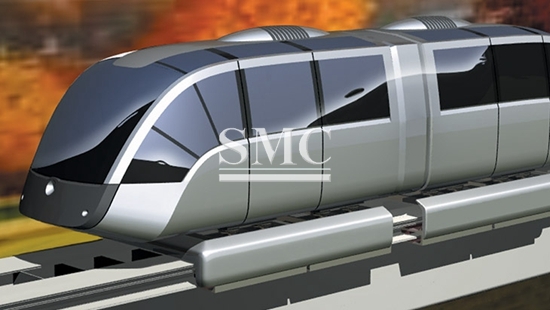 The maglev will allow train to travel at a faster speed compared to conventional railways. The record speed was broken by the L0 maglev in Japan that travels at 603 km/h. Although it is much more expensive to produce and integrate a maglev, they require less maintenance and do not have to deal with the wear and tear of wheels. Maglev’s are much more efficient, depending on how far and fast you want to travel. At lower speeds, a regular train will probably be more efficient. But unlike regular trains, maglevs do not experience the rolling resistance that come from the wheels. They only encounter air resistance and electromagnetic drag, which can potentially improve power efficiency. Because maglevs do not have wheels touching the rails, they produce less noise. There are many benefits that come with having a maglev in your area. Overall, maglevs are able to provide a faster commute to neighboring towns and can be more efficient.